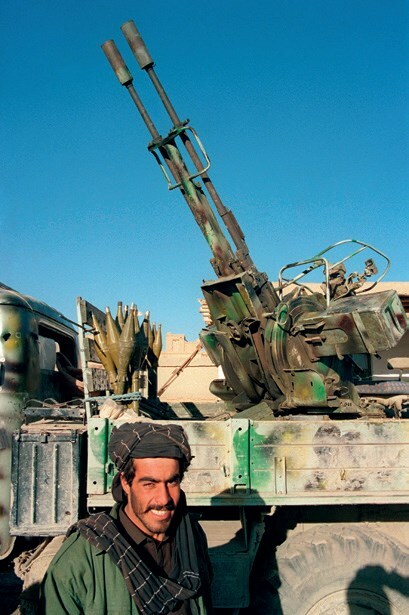 Good detail of a camouflage painted 23mm ZU-23-2 cannon in use with Taliban forces in 1995. The truck is likely a Soviet GAZ-66. 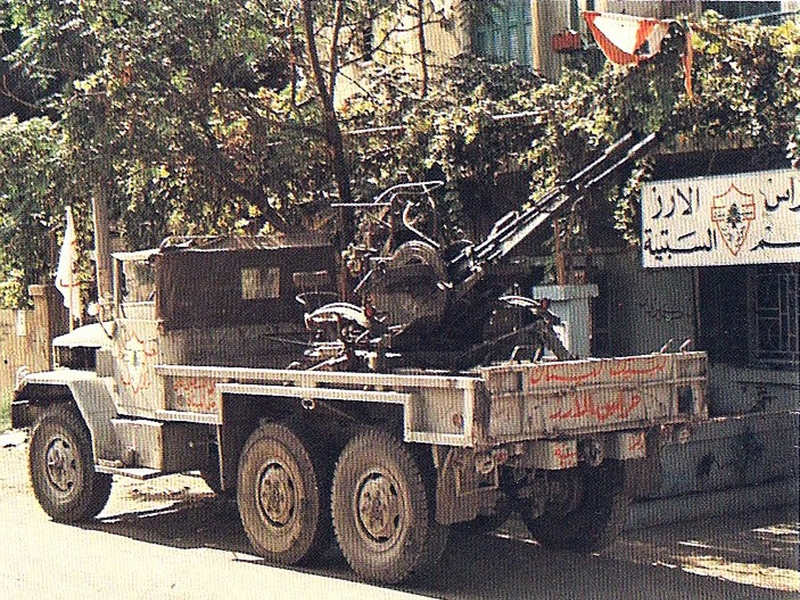 An Amal M35 `heavy technical’ or `gun-truck’ mounting a 23mm ZU-23-2 AA cannon, West Beirut, 1985. All factions in Lebanon mounted the versatile ZU-23-2 on everything from light trucks to M113 armoured personnel carriers. An M34 armed with a ZU-23-2 AA gun belonging to the Guardians of the Cedars militia during the early stages of the Lebanese Civil War. 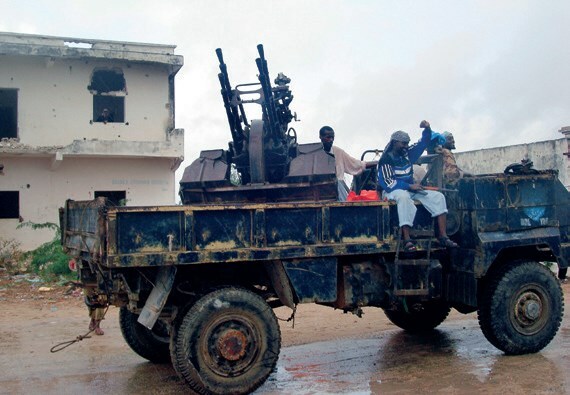 Somali Islamic Courts Union (ICU) insurgents manning a formidable four-barrelled 14.5mm ZPU-4-equipped Unimog-based `heavy technical’ in Mogadishu, 2006. There are many machines, weapons and items that have marked the history of war throughout the ages. Roman legionaries had their gladius and their helmets, samurai had the katana and so on. In the second half of 20th century all the revolutionaries and the rebel movements were distinguished by the well-known AK 47 and, in the last decades thirty years, even by the technical vehicles. An open backed civilian pickup truck or four wheel drive vehicle mounting a machine gun, light anti-aircraft gun, anti-tank weapon, or other support weapon. It has played a big role especially in the conflicts that have been taken place in Africa and in the Middle East. The technicals have become the cavalry of any insurgent movement in that territories. They respond to the request of rapidity and fire power that all those groups need, without spending the money that only a government has. They need no specific training to be driven and no special logistic support. However, they do not have only strong points. Being civilian vehicles, they are not designed and adequate for combat purposes, so they do not carry any kind of protection or armored for their passengers and crew. The term “technical” comes from the Somali civil conflict. In the early 1990s, NGOs that operated in the country were barred from bringing in private security, so they hired local gunmen to protect their personnel, using money as “technical assistance grants”. Eventually the term broadened to include any vehicle carrying armed men. The technicals became so important that a power of a Somali warlord could be measured by how many vehicles he owned. Even if the term was coined during the Somali civil war, the use of improvised fighting vehicle dates back to the invention of automobile, and eve earlier, to the horse drawn tachankas mounting machine guns in eastern Europe and Russia. During World War II, in northern Africa, various units, like the British Special Air Service (SAS), recurred to unarmored motor vehicles, often fitted with machine guns and cannons, to carry out their actions in the desert. The first rebel group that recurred to these vehicles was the Polisario front in its struggle against Moroccan and Mauritanian governments for the independence of western Sahara. These fighters became masters in the use of technical, relying on their speed and rapidity to launch assaults against Moroccan and Mauritanian troops and disappearing in the desert immediately. Technicals were widely used even in the conflict between Libya and Chad, that became famous as “Great Toyota War”. During the clashes between the two armies, it was discovered that these light vehicles could ride through anti-tank mine fields without detonating the mines when driven at speeds over 100 km/h. The Toyota War was unusual in that the force equipped with improvised technicals prevailed over the force equipped with purpose-built fighting vehicles. Eventually Chadianvictory was also due to the fact that those vehicles mounted modern anti-tanks missiles MILAN, that gave a big advantage against poorly equipped Libyan troops. Somali conflict marked the turning point for the use of technicals. Reporting from the frontline, all the TV channels that followed the war broadcasted the images of Somali rebels fighting against each others and against UNISOM troops on those vehicles. All the factions have used them. Mohammed Farrah Aidid, the most famous rebel leader, deployed 30 technicals along with a force of 600 militia to capture Baidoa in September 1995. After he was killed in clan fighting in 1996, his body was carried to his funeral on a Toyota pickup. The president of Puntaland, General Adde Musa, personally led personally fifty battlewagons to Galkacyoto confront the Islamists on November 13, 2006. American Special forces employed them in many clandestine operations in Afghanistan. Special Forces used Toyotas on the battlefield for several years, until the increased proliferation of Improvised Explosive Devices forced them into military-grade mine-protected vehicles. But Afghan troops still use Toyotas by the thousands. Before the collapse of his regime, even Saddam Hussein forces used techinicals. Afterward,the Coalition also supplied technicals to the Iraqi police. Private military contractors drove also technicals and the United States military used modified Toyota Tacoma pickups (purchased from auto showrooms in the USA and modified before delivery) as well. These vehicles appeared also in the Darfur conflict. During the Libyan civil war, both regime loyalist forces as well as the anti-Gaddafi forces used technicals extensively. Given the type of warfare that had been carried out in the conflict—wherein highly mobile groups of soldiers and rebels continued to move to and from on the desert terrain, retreating at a time and then suddenly attacking to regain control of small towns and villages in the Eastern rebel held parts of Libya—had led to the technical becoming a vehicle of choice for both sides. Technicals had also been widely used by the rebels whilst setting up checkpoints. It also formed a vast percentage of the rebel inventory which was limited to light weapons, light body armor and very few tanks. In the ongoing Syrian civil war, technical have been seen on sides of loyalist forces and rebels and Islamist factions. The kind of weapons mounted on technicals varies widely, from light machine guns to anti-aircraft guns and even BMP-1 turrets. ISIS captured many Iraqi police and army techinicals during its offensive in the north of Iraq. Even Peshmerga fighters have tested the versatility of these vehicles, relying on their agility to surround and attack ISIS forces. Technicals seem to have become a landmark for the fighters of asymmetric conflicts. Their agility has allowed poorly equipped forces to be more effective, even against better equipped enemies.The fact they are cheap, easy to use and perfect for the harsh terrains in the Third World countries, make them the best option for every fighter group that can not afford expensive and sophisticated armored vehicles. The practice of bolting an anti-aircraft gun into the bed of a truck or pick-up in Beirut was also driven by the battlefield environment itself. Fighting from the ruins of multi-storey apartments or office blocks was the norm and the weapons systems mounted in most AFVs simply couldn’t elevate their barrels high enough to engage their attackers. AA guns were pressed into service and proved ideal in combating snipers and RPG teams on rooftops and upper floors. This innovative use of AA cannon would later be repeated by the Russians in both Afghanistan and Chechnya to combat opponents utilizing the high ground. A bewildering variety of pick-up and light trucks, both military and civilian, were present in Lebanon. The Syrian Army had adopted the Series III Land Rover in the 1970s, whilst the Lebanese forces had purchased a large number of Series II and III Land Rovers alongside their M38 and later M151 Jeeps. Unlicensed Iranian Land Rover copies manufactured by Morattab were also a common sight. Indeed it was possible to see virtually every version of the Land Rover during the Lebanese Civil War and the platform was used extensively by all factions. These Land Rovers employed by both militia and government forces had one thing in common; invariably, some form of heavy weapon would be pintle-mounted in the bed. Most sported a machine gun, from elderly Browning .30cals to DShK HMGs. Some featured gun shields to provide a modicum of protection to the gunner. Others carried various recoilless rifles, from B-10s to M40s. Like the Land Rover, all factions employed the Toyota Land Cruiser equipped with RCLs and HMGs. Civilian CJ-series Jeeps were also very common. The Progressive Socialist Party, or PSP, used American Dodge and Chevrolet pick-ups mounting AA guns including the Zastava M55 and the ubiquitous ZPU-1, whilst some of their larger Chevrolet C20 flatbeds sported the formidable four-barrel ZPU-4. US-made M35s, the famous `deuce and a half’, were modified to mount heavy AA platforms like the ZPU-4. The Lebanese Forces militia deployed large numbers of Iranian-made Keohwa M-5GA1 Jeeps mounting the M40 RCL, the Milan ATGM and the Chinese Type 63 12-barrelled rocket launcher. Indeed this appears to be the first documented use of such field expedient MLRSs on a technical. Years later, such employment would be common during the civil wars in Libya, Iraq and Syria. Two types of technical dominated in Somalia. What US Special Forces termed the `heavy technical’ were mainly Mercedes and Spanish Pegaso trucks with AA cannon mounted on the flatbed; the ZPU-1 and ZPU-2, the ZU-23-2 and even the ancient but still-deadly World War II-era 37mm M1939 all proved popular. In Chechnya, although the insurgents did operate a limited number of ZPU-2 and ZPU-4 AA cannon mounted on the flatbeds of trucks in the mountains surrounding Grozny. Here, Russian helicopters, including the infamous Hind, could be seen at greater distances and engaged by a mixture of ZPU cannon and SA-7 SAMs. Libyan rebel groups widely use trucks from the Chinese manufacturer Zhongxing (ZX) prominently feature in the hands of the militias, including a model cheekily named the Grand Hiland. 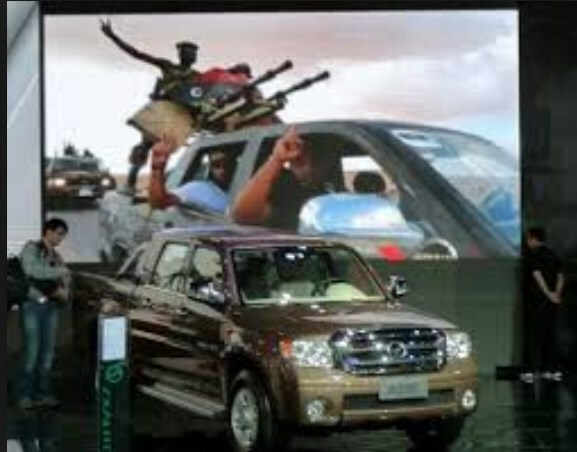 Uniquely, the firm used their new-found notoriety in their marketing campaign at the 2012 Beijing Motor Show, where Zhongxing pick-ups were displayed against colourful backdrops of Libyan technicals with the slogan `Stronger-Than-War’. Large numbers of 14.5mm KPV heavy machine guns (the same weapon used in the ZPU AA gun) were looted from Libyan Army stores and now feature on many technicals, along with the PKT MMG pilfered from destroyed AFVs. Large numbers of US M2 and M3 HMGs (the latter normally being a variant deployed as a helicopter door-gun) have also been seen, including at least one example mounting twin M2s in what appears to be a factory mount similar to the Platt Mounts systems used by UKSF. Heavy technicals mounting a dizzying array of AA guns are in use as direct-fire artillery to shoot-in ground assaults. Along with the familiar ZUs and ZPUs, 20mm Hispano-Suiza HS. 820s, S-60s and even Romanian twin-barrel 30mm Model 80 cannons have all made an appearance. Even Russian Gryazev-Shipunov 23mm and 30mm cannons have been pillaged from former Libyan Air Force aircraft and affixed to a range of light trucks using homemade mounts, although, as we shall see, this is far from the only type of aerial weapon to be reimagined for use on a Libyan technical. The Libyans were the first to improvise components from BMP-1s. Along with the use of actual BMP-1 turrets, often with hillbilly armour used to shroud the frame supporting the turret, the 73mm gun itself has been retrieved from destroyed BMPs and mounted in a clumsy mechanism bolted to the tray bed of Chinese ZX pick-ups as a kind of technical mounted cannon. Its accuracy can only be guessed. Like Libya, the on-going civil war in Syria has seen a bewildering number and variety of technicals deployed by all sides in the fighting. The Syrian Army themselves employ a large number of technicals, including variants built upon the Hyundai Mighty, a flatbed commercial truck available in 2.5- and 3.5-ton variants. The Mighty has been seen in both commercial colours and crudely applied camouflage patterns. Weapons mounted upon the Mighty include the standard ZPUs and ZU-23s to S-60s and various aerial rocket pods. Heavier trucks including Russian-supplied Ural-4320s mounting twin-barrel ZU-23-2s are also commonplace. Along with the DShK, Russian and Chinese AA guns are by far the most prevalent heavy weapon encountered on insurgent technicals. Two types are common: the 14.5mm ZPU based on the KPV HMG design and the 23mm ZU-23-2 cannon. A range of other types, including the 20mm Zastava, 35mm Oerlikon and even ancient Russian 57mm S-60s, are also seen, although in far fewer numbers. The ZPU is manufactured in three variants: the single-barrelled ZPU-1, the twin-barrelled ZPU-2 and the fearsome four-barrelled ZPU-4. The ZPU-1 and 2 are the most common and can be used against both ground and air targets. 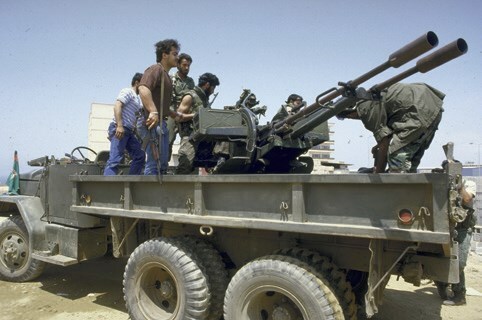 In the Libyan Civil War, technical mounted ZPUs were employed in place of traditional artillery to suppress targets in preparation for ground assaults. The ZU-23-2 is even more powerful, a fact that has resulted in more than one video shared on social media showing the recoil of the twin 23mm cannon tipping over some poorly balanced technical! The 23mm round offers both the ability to engage ground and air targets at extended ranges and an anti-armour capability. For example, Houthi insurgents have successfully engaged Saudi tanks in Yemen, whilst the weapon is also credited with downing a number of Syrian Air Force helicopters. This entry was posted in Weapons by MSW. Bookmark the permalink.